Designed to help you connect with and heal your Inner Child, transforming the past to create a new future. Transforming the inner child helps you develop a more positive personality, balanced emotions and greater spiritual connection, as well as creating powerful soul growth. These 36 beautiful Flower & Gem Essence combinations were created by Shimara Kumara at Heartsong to facilitate the healing of your Inner Child and to help you return to the radiance of your pure, true self. There is also a set of Divination cards to accompany this set. These Sacred Inner Child Essences have been given to the world, through my higher self, from the Ascended Masters who are guiding the spiritual transformation of this planet at this unique time. This book contains the channelled information I received for the Inner Child Essence combinations as well as other issues related to Healing the Inner Child. Healing the Inner Child is one of the most empowering things we can do for our emotional well-being, which promotes a raising of consciousness, higher understandings of one’s own childhood and, most importantly, a clearing of deep emotional hurts and imbalances. As we release fear, lack of self-worth, guilt and a myriad of other ego patterns, so we start to heal our inner child, that we may experience more joy, peace and love in our hearts and lives. This leads to a transformation of our life and more harmonious, loving relationships as we create a new reality. This then brings deep emotional healing and transformation of the past to create a new future: one based on emotional and mental balance, restored inner peace, and, most importantly, more Unconditional Love. Resolving our unhealed issues helps to change our whole life for the better, including all our personal relationships. We then feel more joy and happiness, as our magical, healed inner child creates a more loving reality in our daily life, through our positive thoughts and emotions. This also helps to raise our consciousness to higher levels on our path of spiritual unfoldment, thereby healing us through all the dimensions of our being. I was very blessed to be helped with this book by my partner, Jeremy Opie, not just through his typing up of my channelled information (which is often difficult to decipher!) but also through his inspired creation of the additional essence indications and references to the chakras and subtle bodies. These are wonderfully accurate and will be very helpful to practitioners and all those using the Inner Child Essences. Both the Inner Child Essences and related Inner Child Divination Cards are a joyful gift from the Ascended Realms and Mother Earth, that we may all become, that Rainbow Warrior and Magical Inner Child that delights in helping to co-create a new Divine Future for all mankind. 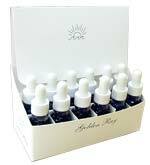 Take 4 - 7 drops on the tongue from the chosen bottle, between 2 -4 times a day, especially first thing in the morning and before bed. Try 4 times a day at first. For those who are very sensitive start with twice a day. Monitor your thoughts and feelings and make notes of any changes you may feel. If you need any help or advice with choosing or using the Inner Child Essences, please see our Choosing An Essence page or you are most welcome to contact us if you would like to speak to someone.